FC Barcelona are set to take on newly promoted Girona on Saturday, 23 September 2017 at Camp Nou. 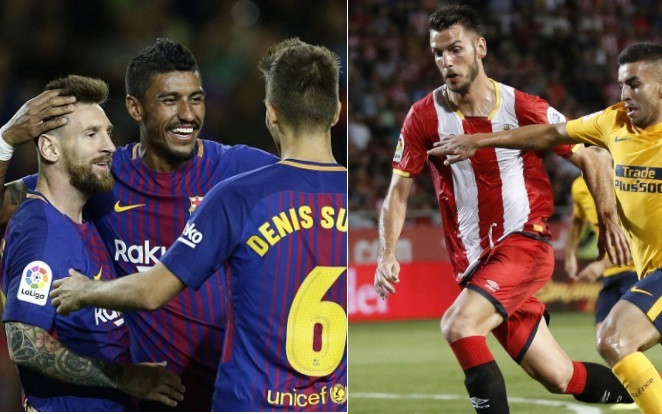 It will be a catalunya derby at the Estadi Montilivi and Barcelona can maintain their 100% record this season with another win while Girona will be looking to win famous three points against Spanish powerhouse. The game will be a traditional night time kickoff starting at around 20:45 CET / 19;45 uk time and we will have live links of the game right here on this page. Barcelona has won all five opening games taking their points tally to 15 points and that is open up a 7 points lead against arch rivals and defending champions Real Madrid. Another three points will keep the distance and put more pressure on Real Madrid who seems to be struggling against the midtable teams this season. Lionel Messi has already scored 9 goals in the league and 12 in total and looks in absolute cracking form. Team News & Possible Lineups: Barcelona manager Valverde is set to make several changes from the team which beat Eibar in midweek. We can expect the likes of Luis Suarez, Ivan Rakitic, Samuel Umtiti and Jordi Alba to slot right back in the starting lineup after being rested in midweek. Messi is set to start upfront with Suarez and Vidal while Iniesta, Rakitic and Busquets to take central midfield roles. This is how I expect both teams to lineup on Saturday. Lionel Messi will be the play to watch out for having scored 12 goals already this season and if Girona concede early they will be in for a long night. Match Predictions: Barcelona are set to visit Girona in what could be a mismatch at least on paper. However La Liga seems far more unpredictable this season as it has been in the recent past. Barcelona are relying heavily on Lionel Messi’s performances and goals so far this season but if the teams can nullify Messi’s threat they do have a good chance of upsetting this fragile Barcelona side. Having said that im going with a comfortable win for Barcelona in this one.